Like all professional zoologists, I own several sets of novelty animal-based playing cards. One such set is “Dangerous Australian Animals”. This is a particularly good set as in addition to the usual playing card graphics (hearts, diamonds, etc), not only do you get a lovely picture of a Dangerous Australian Animal on each card, but you get a star rating, out of five, of exactly how Dangerous it is. The manufacturers would have had to work pretty hard to narrow it down to just 52 Dangerous Australian Animals, given that most lifeforms in Australia are Dangerous. a) The southern cassowary, from all three of those places (and the species on my playing card), which is the third tallest (after the ostrich and emu) and second heaviest (after the ostrich) living bird. b) The northern cassowary, from the northwestern tip of New Guinea and a few nearby islands. c) The dwarf cassowary, from mountain rainforests in New Guinea and New Britain, and is the species represented in the Grant Museum by this heart. The first thing you would notice about a cassowary, if you were lucky enough to see them – few people do – is that they have bright blue skin on their naked heads and necks. They also sport a prominent casque (less prominent in dwarf cassowaries) on their heads, which is thought to protect them as they run through the vines and spikes of the rainforest (which is definitely advantageous, if you’ve ever got yourself tangled in the millions of barbs covering wait-a-while vines). The reason they feature on my playing cards is that they have a reputation for being extremely protective of their young, or if cornered, when they may strike out with their huge powerful legs sporting an 8cm dagger-like claw (you’ve all seen the fossil-digging scenes of Jurassic Park). 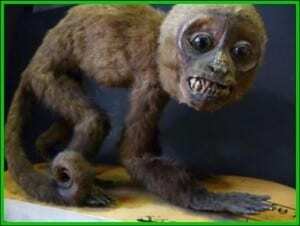 Despite this reputation, they mainly eat fruit and are key disperses of seeds in their forests. Daddy cassowary does the child-rearing, and indeed are subordinate to females they may meet in their generally solitary lives. After the female lays a clutch of eggs directly on the forest floor (she can’t even be bothered to make a nest), the male will incubate them for nearly two months. After they hatch, cassowary chicks are brown and stripy, and altogether hard to spot (which can be dangerous if you obliviously wander into one, as I have, and then get a bit panicked about where daddy and his Jurassic Park claws are). The male will then stay with the chicks for nearly a year and a half, which makes me wonder how female cassowaries pass the time. 5) Why do we have a cassowary heart? To be honest it’s a bit of a mystery. 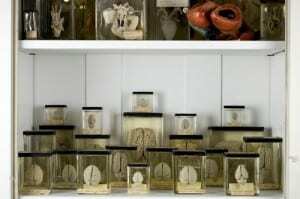 We have, on the shelf above our popular collection of brains, a display of different animal hearts where this specimen lives. 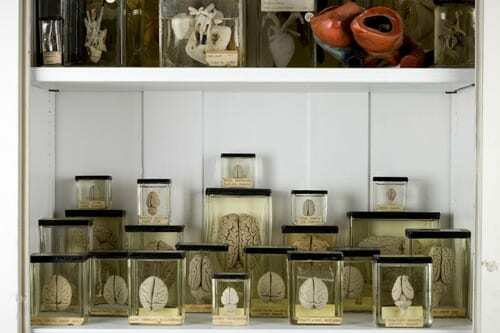 Both of these collections are useful for the study and teaching of comparative anatomy – looking at similar structures in different species and asking why they are similar or different – what can the similarities or differences tell us about the animals’ relationships or ecology. The brain collection was clearly put together for this purpose – they all have the same label and were prepared in the same way. 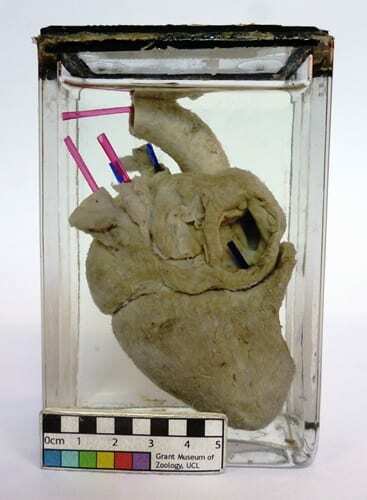 The hearts, on the other hand, while clearly now could be used for comparative anatomy, appear to have been amassed in a much more piecemeal manner – they all have different labels, jar types, and display styles (though many have different coloured rods telling you were the arteries (red) and veins (blue) attached). The cassowary is only similar in label style and jar to the ostrich, which kind of makes sense as the relationships between the world’s large flightless birds is a long-standing question. 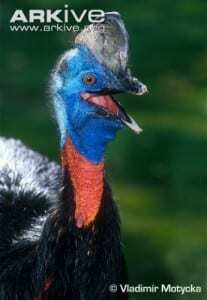 The three specimens identified to species level are all dwarf cassowary. We have no idea where they came from, and though we could never know, it seems to me to be fairly likely they are all from the same individual, as someone must clearly have had to have cut one up to get these bits of anatomy. Hearts, hyoids and reproductive organs are all fairly high on the list of body parts anatomists are particularly interested in. The big question would be, then, where did the rest of the bird go?